Organisations are investing large sums of money in employing external and internal coaching and are increasingly under pressure to show a demonstrable return on this investment. In this much-needed book, Hawkins gives a well-researched and practical answer to the whole question of how you create a ‘coaching culture’ and provides a step-by step guide to implementing this change. The book includes advice for both coaches and HR professionals on. Establishing the right integrated mix of coaching by line managers, internal specialized coaches and external coaches. Case studies show how a wide range of international organizations have developed successful coaching strategies to increase the effectiveness of their businesses. This book will provide you with valuable insights whether you are a coach, an organization consultant, an HR professional or a Chief Executive. Creating a Coaching Culture provides a rich source of knowledge, guidance and experience for anybody involved in the important business of helping drive coaching in organisations. It builds on the Hawkins and Smith seven-step model that we have used to guide our thinking and actions at Ernst & Young. After reading the book I take away a host of ideas and best practice that I will use in the business. Peter Hawkins draws on 30 years of international organizational change consultancy in Creating a Coaching Culture. He offers seven steps, numerous case studies, and his real world experience. Reading this book, it is easy to pinpoint how far along one's organization has moved towards developing a sustainable coaching culture and what the next steps are. 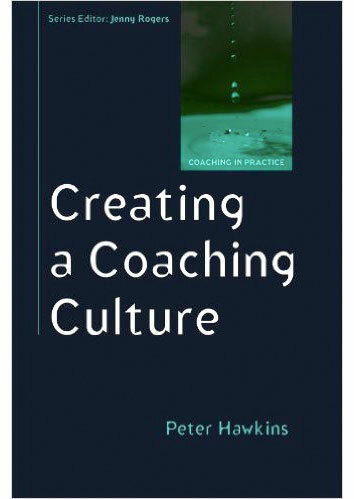 Like Peter's other books, Creating a Coaching Culture sits on my desk, not my bookshelf, because of its usefulness, depth of thought, and Peter's expertise. The book clearly outlines why the creation of a coaching culture is critical to the success of any organisation. More importantly it describes the practical steps required to achieve this success and how you can measure progress and benefits along the journey. In recent years, the concepts of leadership culture and coaching culture have become increasingly intertwined, to the extent that achieving a coaching culture is a common aspiration for organizations of all sizes … Peter Hawkins brings the topic up to date, using multiple case studies and an analytical approach that clarifies the challenges and how to address them. In this book Peter Hawkins brings together his extensive experience as a business leader, coach, consultant and leadership developer to provide a comprehensive handbook on how to help people, teams and organisational stakeholders learn through the practice of coaching. It will be of benefit not only to those engaged in the people development professions, but also managers and leaders who are looking to enhance the value and potential contribution of their people. This is an eloquently written text that is recommended reading for coaches and mentors working in large organizations, for human resource managers and corporate management teams. Have just finished reading this it is excellent and like all Peter's books practical but well informed.